Following the great success of Stealth GPS-3X we wanted to offer the possibility to enjoy the innovative features of that product also to users who, at the moment, could not be interested in Data Acquisition and Track Mapping features. 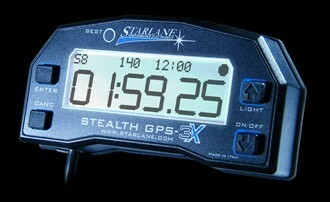 -IF YOU DON'T WANT TO USE YOUR COMPUTER OR PRESS BUTTONS WHILE ON TRACK, THE SAFD-2 FEATURE (Starlane Automatic Finish line Detection), WILL SPLIT AUTOMATICALLY THE TRACK AFTER THE FIRST 2 LAPS RUN, ALLOWING YOU TO SEE YOUR LAPTIMES AND INTERMEDIATES FROM THE VERY FIRST SESSION WITHOUT ANY ACTION ON THE LAPTIMER. -MAIN TRACKS FINISH LINES LIBRARY SUPPLIED WITH DIGIRACE-MMX SOFTWARE AVAILABLE FOR FREE ON THE WEBSITE. -LAPTIMES AND MAXIMUM SPEEDS DOWNLOADABLE TO PC WITH REPORT PRINTING FEATURE. -FIRMWARE UPDATE DIRECTLY FROM WEBSITE. BUT THE FEATURE MAKING STEALTH GPS-3X LITE ACTUALLY UNIQUE ON THE MARKET, IS THE POSSIBILITY TO UPGRADE IT ONLINE TO THE FULL VERSION, WHICH ACTIVATES ALL DATA ACQUISITION AND TRACK MAPPING FEATURES ALIGNING IT TO STEALTH GPS-3X. ONCE UPGRADED YOU CAN ALSO EXPAND IT WITH ALL THE OPTIONAL RID MODULES. » 29/10/2017: CORSARO WIRELESS SYSTEMS KEEP RULING! » 04/09/2016: TWO WORLD TITLES IN ONE DAY FOR CORSARO! » 11/10/2015: Massimo Roccoli 600 Supersport Italian Champion with CORSARO. » 10/05/2012: DIGIRACE-MMX 2.0 RELEASED! This website uses first-party and third-party cookies for technical purposes and to collect anonymous analytics data, respecting your privacy and according to law.